We raise rare-breed pigs on woodland in the Black Mountains, striving to be sustainable, ethical and with high welfare. 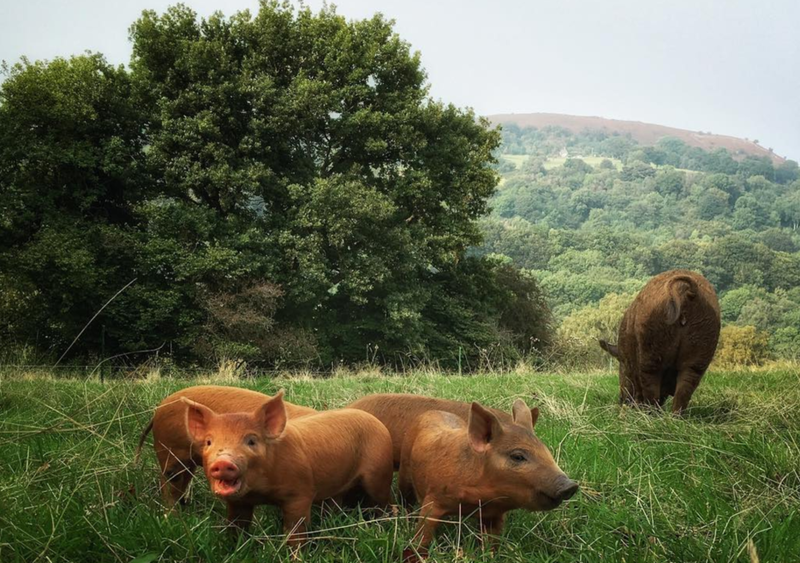 We keep rare breeds because they are suited to our environment in the Black Mountains, they make a variety of great pork products, and we think it's important to keep rare breeds going. Rare breed pigs are slower growing than commercial breeds and are, on average, twice the age of an intensively reared pig, giving much more flavour to the meat. By buying products from rare-breed animals the consumer is creating a demand that is fulfilled by increased breeding. Through low stocking rates and frequent pen rotation we can keep our pigs healthier and manage them with less medication by not allowing the build-up of pests, disease and toxins in the soil. This means we can look after the land better too, by giving it a rest, and allowing the woodland and pasture to regenerate and produce more forage for the next group of pigs to enjoy. Our pigs are fed barley, wheat and other grains, seasonal fruit and veg surplus from around the farm and they get up to a third of their feed from natural forage such as hazelnuts, blackberries, apples and acorns. Our pigs live outside in small family groups and sleep in cosy pig arcs filled with straw. Our pigs tend to sleep in a sweet pyramid bundle formation. Rare breed pigs are suited to being outside and are good at finding forage. Being outside lets them express their natural behaviours like rooting, making wallows, and foraging, rather than being on concrete like intensively reared animals. We take the time each day to check the pigs, making sure the animals are healthy and happy. Large Blacks form the majority of our herd. They are a great bacon pig because of their large frame and long back. The Large Black is the rarest of the rare breeds, with only 250 breeding sows left. We have had three Large Black litters so far, and they are a joy to watch as they go about their daily lives. The Large Black is, as the name suggests, large and black. They have huge ears that flop down over their eyes giving them a docile nature. We keep them because they thrive outside and are good at finding forage. They are a friendly and relaxed pig, the only trouble is when they get to 150kg and they still want to use your leg as a scratching post. The Mangatams are a cross of the Mangalitza pig, much prized in America, and the traditional Tamworth. The Mangatam is very close to a wild boar. They are a slow-growing pig and have amazing marbling through the meat and a creamy hard fat that makes it ideal for curing and charcuterie. Our Mangatams are a medium size with a thick coat of hair that ranges from white blonde, through bright orange, to auburn with a beautiful golden shine. Their thick coats combined with their close nature to a wild boar makes the Mangatam a clever and agile pig…and vocal too. They have a disregard for electric fences and they can clear a four-foot hurdle from a standing start which is quite a sight, but we like them for being a true forest pig, and they are quite sweet too. Durocs are a modern breed that do really well outside and create delicious hams. They have the highest levels of intramusclar fat of all the breeds but without having too much back fat, which is the best of both worlds. They are by far the most chilled breed we have and their impressive growth rates make them ideal Baconers. Lauren calls the weaners little Henry the Eighths due to their impressive muscle structure at such a young age. They are also really protective mothers which is great for the piglets, so we just leave them well alone when they farrow.